Hadrian’s Wall begins, in the west, at Bowness-on-Solway and finishes, unsurprisingly, at Wallsend on the East coast of Northumbria. The wall is impressive even in its ruined state. Even as a low ruin, the regular watchtowers and camps show that it was once a serious fortification. 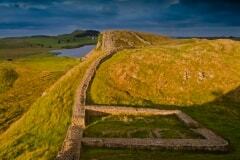 Completed in 128 AD, the wall’s purpose was more to mark the outer boundary of the Roman Empire. Occasional raids from northern tribes did not pose a serious military threat to Roman Britain; at least, not enough of a threat to justify such an enormous fortification. We also know there was relatively free movement from one side of the wall to the other, and the locals on both sides did not allow the wall to stifle trade. As a statement, the wall still serves well and it’s clear that intact fortifications and even sparse patrols would have made it quite impressive 900 years ago. This photo is of a small watchtower, which regularly break up the 80 mile-forts of Hadrian’s Wall. The wall stretches across steep moors and crags for much of its length, taking advantage of natural barriers to increase its defensibility and visual impact. This does make it difficult to see a lot of the wall at once, especially in one photograph. You wouldn’t expect to see much more than pictured here all at once. To really gain a sense of its scale, you would have to walk (at least some of) the wall, take in a few views north and south, visit a mile-fort or two. If you don’t mind occasional bad weather and enjoy the fresh air and stunning scenery, I’d highly recommend seeing Hadrian’s Wall as much as you’re able. If, however, you’d rather enjoy the views and the history from your sitting room, prints of this photo are available here.